The AFL has been conducting some relatively secretive trials regarding a new format for footy involving a rectangular field and smaller sides. With the AFL preparing to launch the concept in the pre finals bye, heres what we know. The AFL has confirmed it is looking to showcase the new version of the game between the best players from teams that miss this year’s finals series. Prizemoney and incentives are being discussed while matches which could be televised nationally on Fox Footy. One concept under consideration would see clubs pay a fee to enter the inaugural AFLX event, with the entry fees pooled to help fund prizemoney. In August it was revealed that AFL-X would not take place in the bye, but would likely be shifted to the 2018 preseason. With Mclachlan saying the league needed more time. PLAYED on a soccer-size pitch. Trial games have been played between teams of seven players, with three on the interchange bench. ONE umpire, no centre bounces and kick-ins from full-back after each goal. There has been at least 3 trial runs of the game. The AFL trialled the concept with North Melbourne during the pre-season and made adjustments after a series of further practice matches between players from VFL sides. 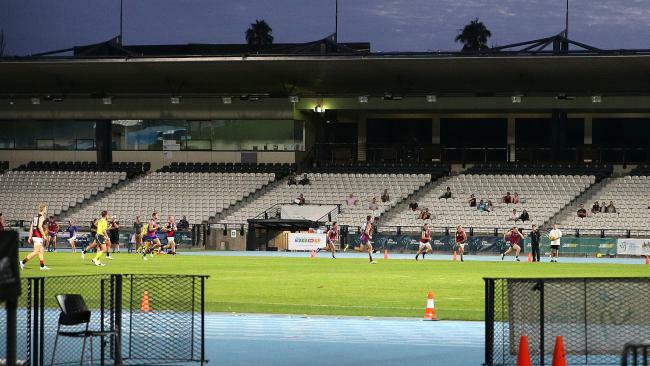 The Heraldsun reported on March 12th, that players from VFL teams Port Melbourne and Coburg faced off behind closed doors at Lakeside Stadium on a Friday night. In the trial, Port Melbourne and Coburg played four 10-minute quarters, two of them with eight players a side and two with seven. In August, 2017 it was revealed that Seven were interested in broadcasting AFL-X. Caroline Wilson reported in September 2016 that The AFL is facing legal action from a Melbourne entrepreneur who claims he took the AFL X concept to the league last year and filmed a trial of the modified game he titled “All-Star Football League”. It is understood the original trial was filmed in June 2014 at AAMI Park with A-grade amateur sides Old Trinity and De La Salle taking part. The AFL reportedly raised concerns that the concept could confuse the market as it was too similar to AFL 9s. Michael Lynch wrote in Fairfax media last September that the AFL might have a fantasy about using soccer pitches to pioneer a new short form of the oval ball game, but unless millions of dollars are spent on developing new soccer infrastructure the chances of footy’s governing body getting its new concept up and running are limited, according to soccer officials. Soccer officials on Thursday reacted with surprise to reports about the AFL concept, suggesting there simply were not enough pitches and grounds in the country to sustain existing demand from burgeoning soccer clubs, never mind footy teams hoping to muscle in on the terrain. The AFLs ownership of Etihad Stadium may have changed this somewhat. David Koch and the AFL believe it will be the ideal format to transfer the game to China, where ovals are in short supply. Europe and the United States already have rectangular versions of the game – eurofooty and metro footy, and a standardised version of the game could well take off in those areas in line with the AFL vision. Either way, a rectangular version of the game should be easier to accommodate in areas where ovals are scarce. In January, 2018, AFL.com.au reported that the league intends for AFLX to be part of its push into Asia – particularly India and China. On October 17th, 2017 it was reported that AFL-X would play a part in the 2018 preseason with the JLT Community Series likely to be shortened from three matches per club to two, with a round-robin weekend of AFLX games to fill the void. However, when the preseason fixture was released AFLX wasnt featured, amidst some uncertainty. Travis Auld refused to say whether AFLX would be played next year. On November 17th, the AFL finally announced the AFLX fixtures for preseason 2018, with matches to be played over three nights in three cities the week before the JLT series starts. Venues will be Hindmarsh Stadium (Adelaide), Allianz Stadium (Sydney) and Etihad Stadium (Melbourne). Adelaide will host the first round-robin at Hindmarsh Stadium on a Thursday night, the week before the JLT Community Series begins. The Crows and Port Adelaide will be joined by Collingwood, West Coast, Fremantle and Geelong in the first ever AFLX tournament. The fast-paced game will then head to Melbourne’s Etihad Stadium on February 16, where the Demons, North Melbourne, St Kilda, Carlton, Hawthorn and Essendon will compete under Friday night lights. The action then heads north to Allianz Stadium in Sydney on Saturday, February 17 when the Swans, Greater Western Sydney, the Brisbane Lions, Western Bulldogs, Richmond and Gold Coast will face off. In late December 2017, AFL Officials suggested that fans will be encouraged to sit in segregated team zones for the upcoming AFLX tournaments. The League plans to unveil a number of new fan experiences at the three tournaments in February, with venues set to be divided up into club-specific areas. The AFL has confirmed ticket prices for the inaugural AFLX competition with tickets going on sale to members and the general public through Ticketek on Monday 22 January. Adult tickets will cost $15 with concessions at $10, while juniors under 12 will get in for free. All tickets will be general admission.